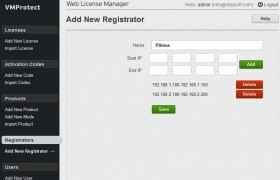 So you have just installed Web License Manager as explained here. Now what. 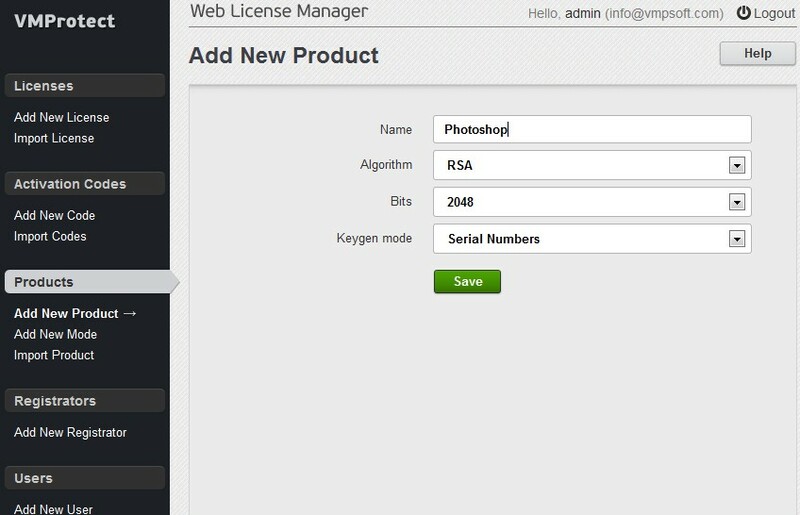 Below is a very short start guide that helps you to setup everything you need to generate and manage serial numbers. The guide assumes that you use a more or less well-known e-commerce provider and understand how do they usually process the serial numbers. Are you ready? Login to the WebLM that you have just installed and let’s go! Press the “Save” button when done. You should now see the new entry in the list. The second step is to create or import a product. 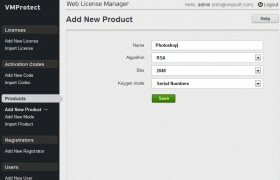 Product is a set of data required to generate serial numbers. You should create a new product every time you need a new type of serial numbers that are not compatible with any other ones. For example if you already have a product “Word” and about to release the advanced version “Word Pro”, you probably doesn’t need a new product, as they may share the same set of serial numbers. However, if you are going to release a “Photoshop” – it’s a good idea to create a new product. Then click the “Save” button and you should see the new product in the list. Move the mouse to that item and you’ll see the set of actions you may do. You need to export that product to use it in VMProtect. Click the “Export” link and save the VMP file to the appropriate place. 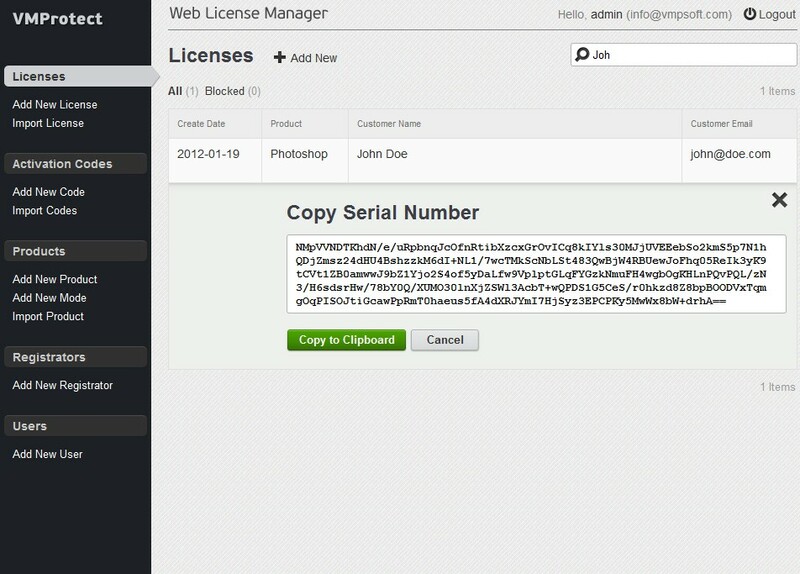 Now you may use it as a separate licensing data file, keeping the protection stuff in another file. 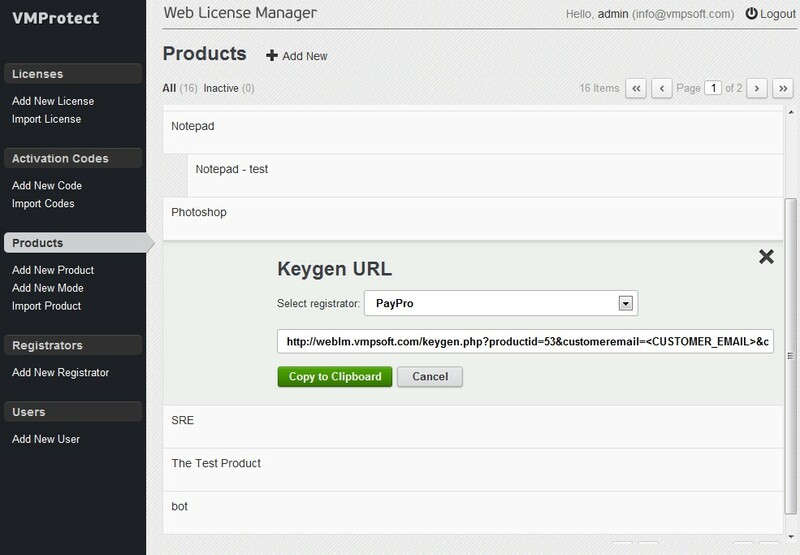 This allows you to sync the online and offline versions easily. 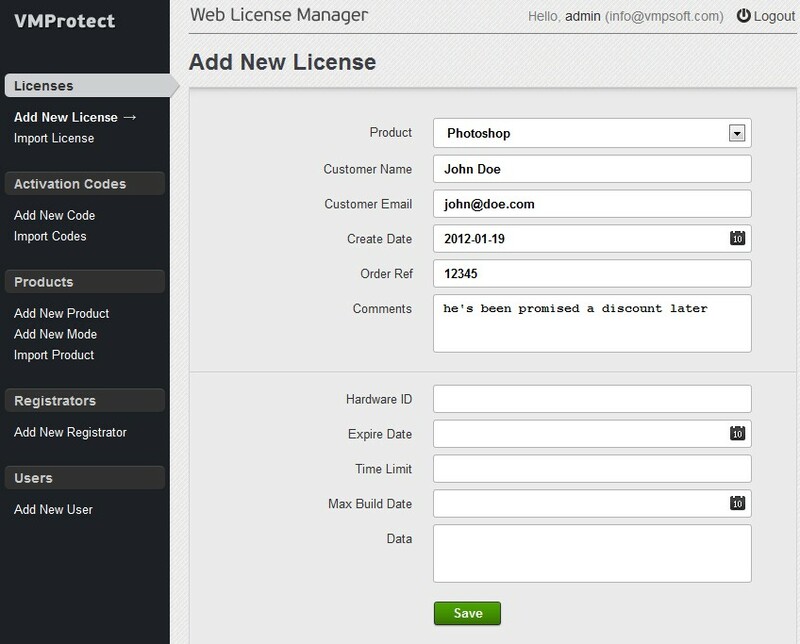 Another way to add a product is to import the existing VMP file with the licensing data. Again, we suggest to split the licensing information from the protection data in VMProtect, so you can sync the licensing data easier. 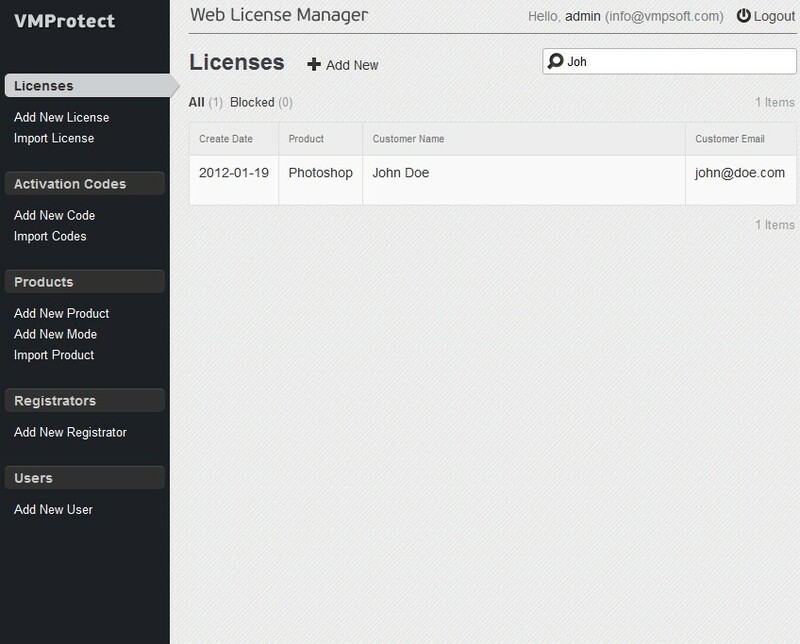 Now when you have a good VMP file with the licensing data, click the “Import Project” link at the left panel. 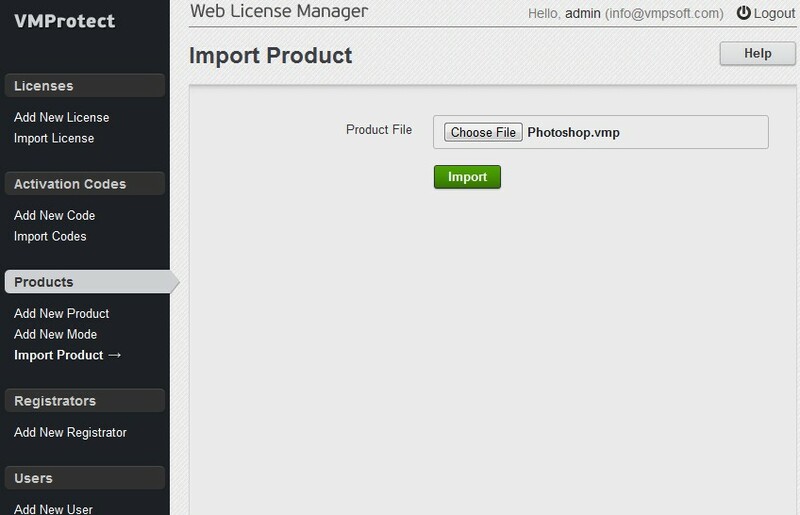 Pick the project file and click the “Import” button. You should see the confirmation window at the end and should be able to locate the product entry at the list. Both two methods are also used to synchronize online and offline copies of your VMP file. You have to keep offline version up-to-date, as otherwise serial numbers blocking will not work. 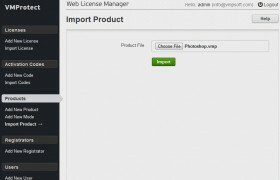 Usually you export the product and replace the local VMP file just before you build the new release. This allows you to have all the blocked serial numbers really blocked. 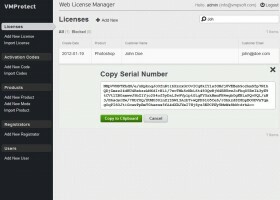 Once again, we really suggest to separate protection stuff from the licensing data using a separate VMP file for the licenses. If for any reason you have changed the local version of the VMP file, just import it as a new product. Web License Manager detects that and updates the online version of the project. 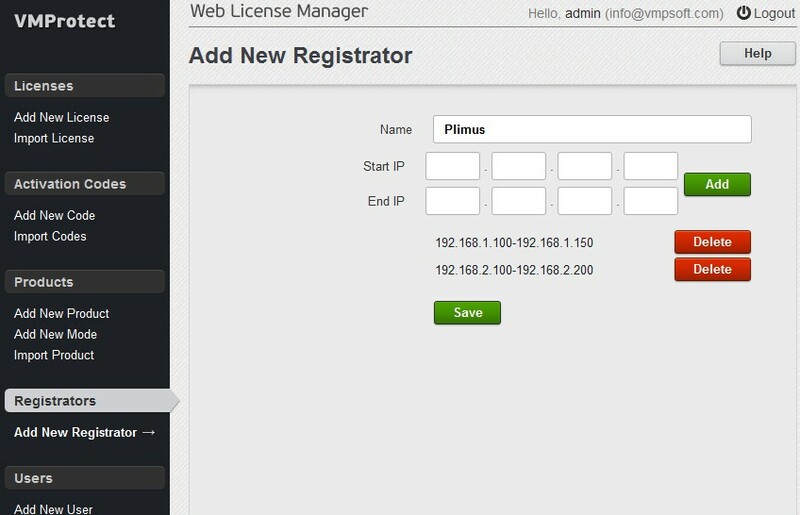 Now click the “Save” button to generate a license. You should be able to locate it in the list now. Use the filter field at the top to narrow the search range. This is useful when you need to generate a trial serial number, or a free one for review. Please note the “Block” action there, this is what you need to click when you are asked for refund or when you got a chargeback. And do not forget to export the product after that to keep the offline version in sync. At last we’ve come to the most important part – the setting up of the automatic serial number generation upon request from your e-commerce provider. Sounds scary? Don’t worry, that’s really easy. Basically, most of the e-commerce providers allow vendors to have serial number generators on their own sites. In that case e-commerce provider just calls a vendor-specific url and passes some parameters like the customer’s name and e-mail as parameters. We have pre-defined some e-commerce providers and if you find one in the list you may simply copy the url and paste it to the e-commerce provider’s form opened above. If you are not so lucky, you may still copy the url, but you may need to adjust the template parameters, so your e-commerce provider can substitute them with the real data. 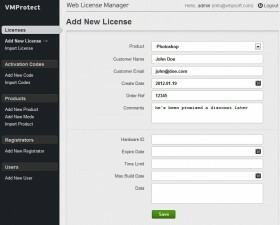 Now you may do a test order and check that a new license has been added to the list. That’s all, folks. You have set everything up in probably less than 10 minutes. 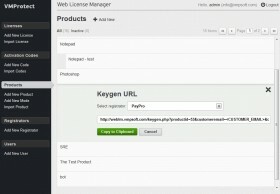 Now you can keep all the licenses online, search them, block them and do whatever you want. There are even more possibilities with the “modes” and “activation codes” features, check them out.